Hey Scrappy Friends! I’m back here today with a layout created from the Felicity Jane Summer kit. I’ve almost killed this one! 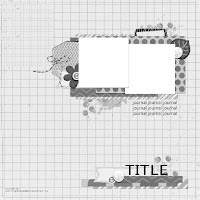 They layout I created today was also used as a short tutorial over at ScraPerfect for my design team spot. I used The Best Glue Ever and some foam to add dimension to my layout replacing the expensive foam tape I used to use. Can you see the shadow under the corner of my photo? I usually start my scrapping with a sketch, but this one I didn’t. I started with what I had left from the kit. The yellow strips are a branding pieces, and the grid is the washi I received in the kit. This has to be my favorite washi ever, and I think I’ve used it in every layout I created from this kit. After I did the main part of the page the upper left felt quite empty, and honestly look odd. To combat that I created a cluster using the washi, some of the kit embellishments and some of my homemade enamel dots. I have also taken to make my splatters with my water brush and inexpensive watercolor set. I’ve found that I get better control with the water brush and I can make my color as vibrant or muted by the amount of water I add. I’m going to try the brush with my color shine next. Okay…I think that’s it for now…back to creating. Until next time…stay crafty! Hey scrappy friends! I’m here today with a layout inspired by Laura’s sketch over at Stuck ? Sketches. I don’t usually do layouts that are all strips as they are a challenge to me, but I figured since I’m challenging myself with the no buy I’d also challenge myself to try sketches that I normally would shy away from. 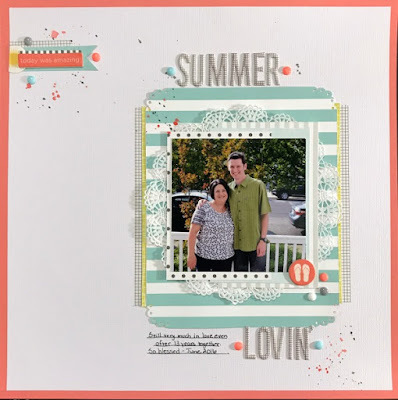 I’m still working on killing my Felicity Jane Summer kit, and this one was made with branding strips, washi and cut up pocket page cards. The embellishments were also from the kit, but I added my homemade enamel dots, and one of the doilies that I bought in a pack of 1,000! Leaving the doily white didn’t give it enough umph so I colored it with a Mr. Huey’s ink dauber that I received in a Studio Calico kit year and years ago. The odd title came from a lack of letters left in my kit, but I does fit if you read my journalling. Every year on the day my parents leave the beach we go for breakfast as a place called Royal Treat. They have the biggest breakfast I’ve ever seen, and thick Italian toast…it must be two inches thick. So the name does fit. 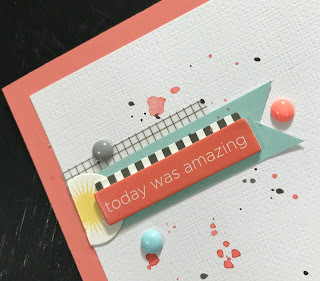 I also turned the turquoise project life card the “wrong way to make the scallops look more like stripes, and I used the black and white stripe branding strip to fit challenge over at Lasting Memories. Hope you enjoyed reading about my process, and I hope to be back soon with new layouts and even a process video. I’ve been so busy just creating that I haven’t stopped to filmed anything. Until next time then…stay crafty! On the last Monday of each month, a group of bloggers participate in a #MovieMondayChallenge, hosted by C’mon Get Crafty! We decide on a topic, genre, or specific movie to use for inspiration and everyone gets free reign to create something wonderful! Now let’s see what everyone else was inspired to create for this month’s #MovieMondayChallenge!! If you’d like to join our Facebook group, you can request an invite here. My movie was School of Rock with Jack Black. IMBD describes the movie like this: “After being kicked out of a rock band, Dewey Finn becomes a substitute teacher of a strict elementary private school, only to try and turn it into a rock band.” On the poster of the movie Jack is also rocking a guitar. I knew right where I was going to go with this! My husband plays bass guitar on the worship team at church, and I have some awesome pictures that people have gotten of him playing. I’m sure the one on the left doesn’t look so awesome on the computer, but in person it’s awesome. Everything is dark and you can just make out my hubby against the lighting. The other thing I used for inspiration was a sketch from Stuck?Sketches. 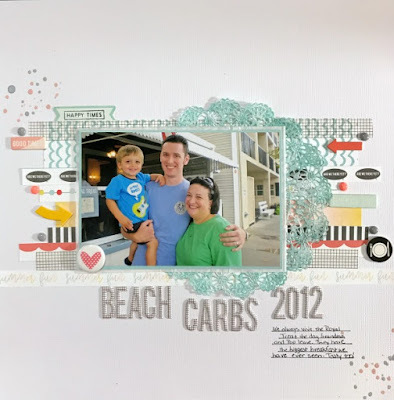 If you are a scrapbooker they have awesome sketches twice a month and I highly suggest checking them out. Most of the goodies on my page are from an older Bella Blvd collection called Max. If this is your first time with me, I am on a year long no buy challenge with some friends so I am working on using old collections up. 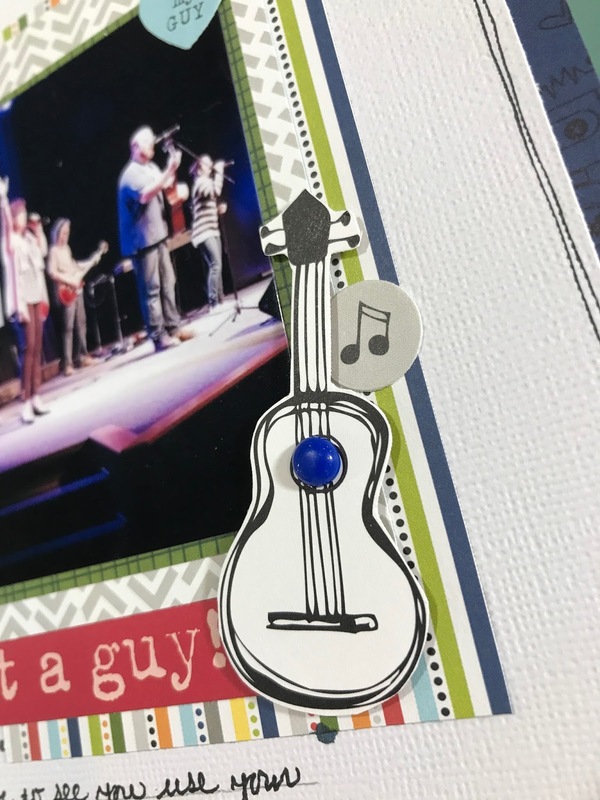 To use more of the collection I cut the guitar and tape embellishment from the paper and posed them up using foam dots. I also added some of my homemade enamel dots, Bella Blvd stars and some Heidi Swapp Color Shine. I thank you for checking out my creation today, and I hope you’ll link up with us showing yours. Until next time…stay crafty! Disclosure: This page may contain affiliate links. This means at no additional cost to you I may receive a commission if you purchase a product from one of our links. I only recommend products I use in my own crafting. My link is also the lowest price I can find at the time of posting. Hey Scrappy Friends! I’m back today with another layout. This one I actually completely while on vacation. It’s amazing how little you actually need to scrap when away from your space. 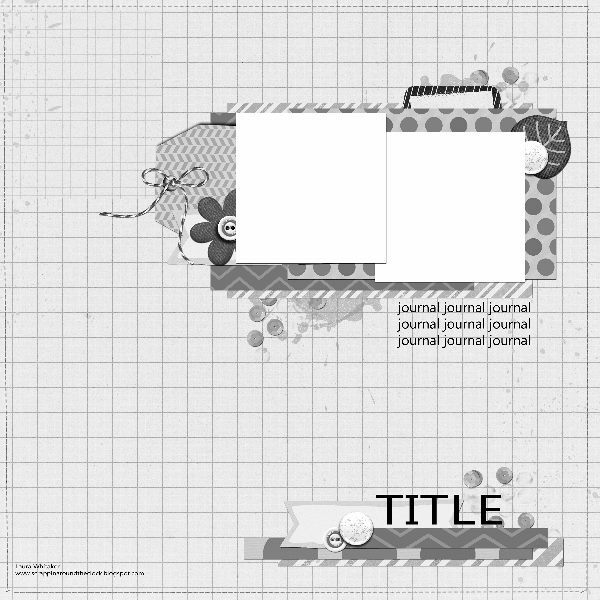 This layout was inspired by the rewind sketch at Rochelle Spears blog and the color/friend challenge at GrandDiva’s Creative Corner. The friend part comes from including a photo of my parents with our kiddos. Hubby and I are blessed for my parents to be considered friends as well as family. It also goes with the new beginnings challenge at Use Your Stuff because our baby girl in this picture isn’t even three months, I hadn’t gone back to work yet, and it was our first time away as a family of four. 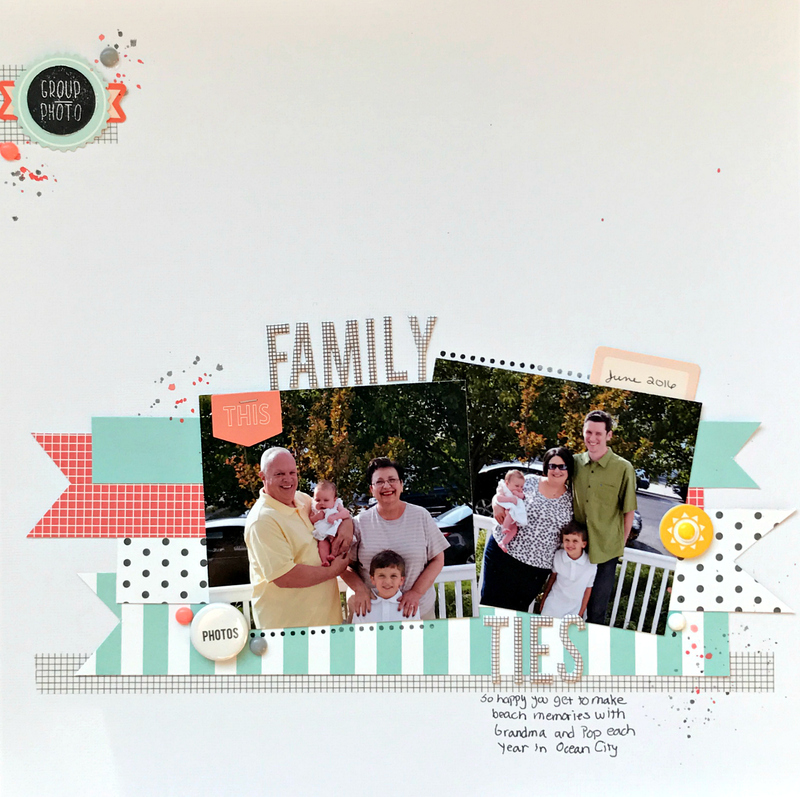 This layout was made with goodies from the Felicity Jane Summer kit. The only things I added were some paint splatters from my cheapy watercolor set and some of my homemade enamel dots attached with my scotch tacky glue. I only used the scotch glue rather than my best glue ever because I had forgotten it at home and Michael’s only carried the Scotch. 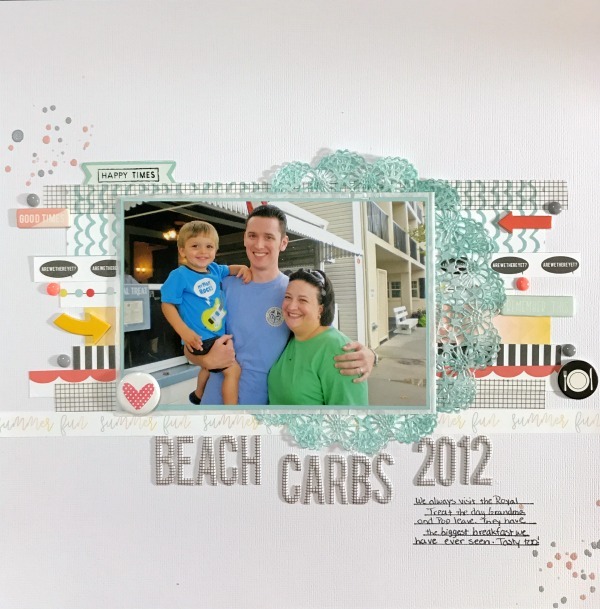 The cluster in the upper right hand corner is several pieces all stacked together and cemented with my Tim Holtz tiny attacher. There is washi from the kit, a label, a die cut that had a saying on it, and then a stamp that I cut out. The stamp is also from the kit. I’m really loving the sets included each month. I’ve never been a stamper on my layouts, but I find having them that I do use them and actually reach for them over and over. Well, we’re off to the beach for a bit as it’s supposed to rain later. Right around nap time…wouldn’t that be perfect! Until next time…stay crafty! Hey Scrappy Friends! 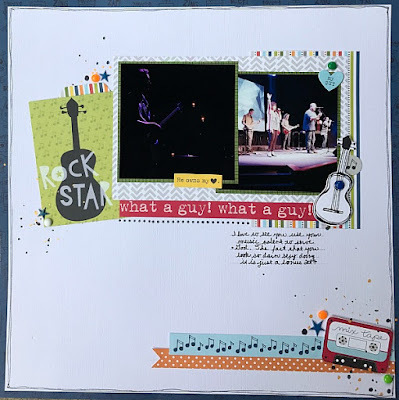 I am so honored to be a guest designer for the Scrap The Boys challenge blog. 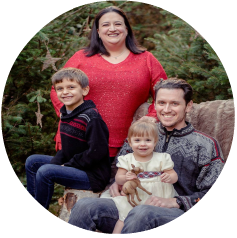 This month their challenge is to use a 5×7 photo. I haven’t used anything that large in awhile and let me tell you…when I got the photo back from the printer it seemed HUGE! The photo is our son all ready for his first field trip that an adult family member wasn’t going on with him. It also wasn’t a small place they were going to a very large amusement park that had wet and dry rides….perhaps you’ve heard of it…Dorney Park and Wildwater Kingdom. I’ll tell you…mom was more nervous than he was. 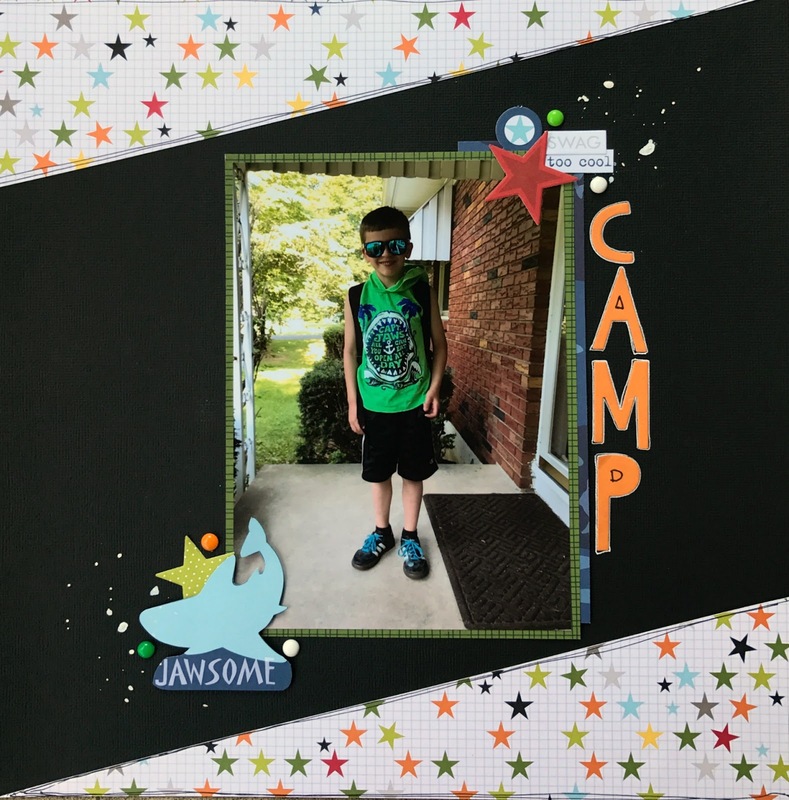 He had a blast…summer camp has been amazing for him and his energy level. 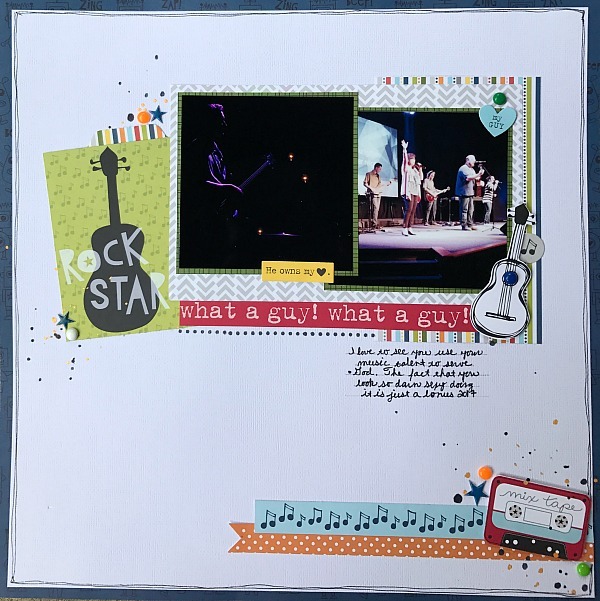 On to the page….Since he was wearing black short and bright t-shirt I choose black textured American Crafts cardstock for my base. I figured the colors would pop off the page better. 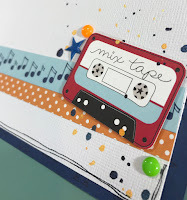 The patterned papers I used are from an older Bella Blvd collection called Max. The title and stars came from the 12×12 stickers sheet. 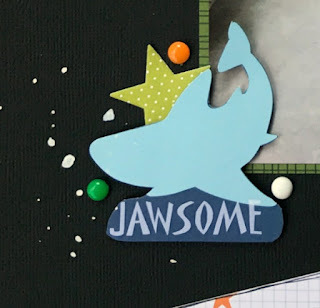 The tiny word stickers came from the trinket stickers, but what I’m most excited about is the shark embellishment. That came from the candid cards which are 2×2 – 4×6 cards that look like they are meant for project life. I fussy cut the shark to match the shark on his shirt. I outlined the title in a white Gelly Roll pen, and the doodle border on the star paper is just a thin Sharpe. Some Dilyussions white linen splatters and some homemade enamel dots and I was done. This layout only took me about half and hour, and of course I didn’t record it. Well, that’s my page for today! I hope you head on over to the Scrap The Boys blog and play long with this months challenge. Be sure to let them know Lyne sent you. Until next time…. Welcome crafty friends! I'm Lyne and I love all things paper related. I primarily create scrapbook pages, but I hope to inspire your cards and off the page projects as well. Our shop carries many supplies for all your paper projects and if you don't see something you're looking for please contact me, and I'll do my very best to help track it down. The Paper Addict is a participant in the Amazon Services LLC Associates Program, Dollar Tree, and Scrapbook.com, affiliate advertising program designed to provide a means for me to earn fees by linking to Amazon.com and affiliated sites.